Today I finally finished reading Living Justice by Jamie Gates and Jon Middendorf. What a great book! I was very convicted and encouraged as I read through this little book and by the end I was filled with hope. I was surprised, given that I picked this up at the Youth Specialties Conference (a mainstream evangelical conference), at how edgy it actually was. The Authors take us from thinking about consumption and economics to distinguishing our identity as "citizens" from our identity as "Christians" (similar, in some ways, to what I talked about in my last post), two very different identities. "Borders mess with out categories of 'us and them'; they tempt us to place others in categories that are not consistent with the fellowship we are called to in Christ. Because of borders we are more likely to think that others are less deserving of our concern, charity, and compassion" (p.54-55). 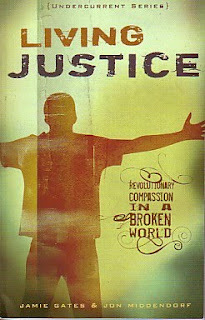 This book really does have an appropriate title because it makes for a fantastic introduction to living justice--the kind of justice that the God revealed in Jesus Christ has in mind. I imagine that if an individual or a group really took this book to heart, great things would happen in them and they'd discover a glimpse of what it means to be a part of what God is doing in the world.